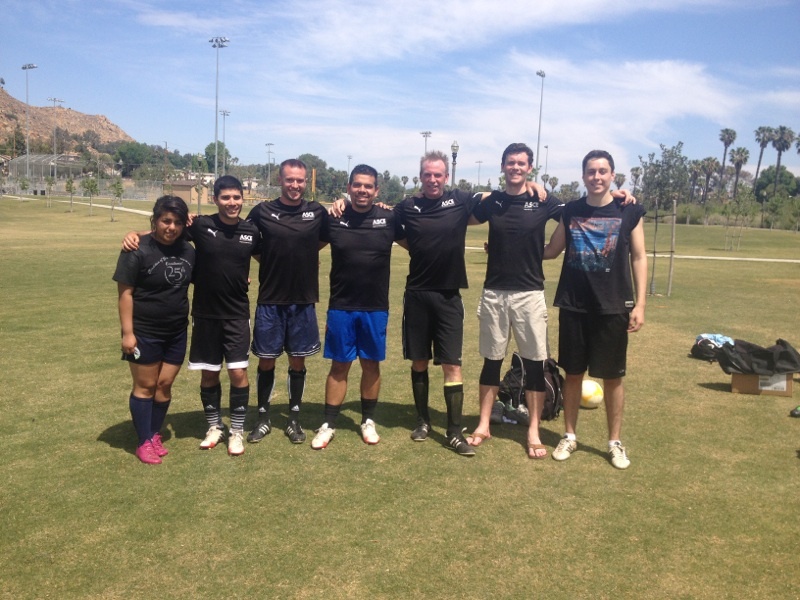 It was that time of year again for the friendly competition between the SoCal YMF chapters in the Annual Soccer Tournament! Every year, the YMF groups from Orange County, Los Angeles, San Bernardino/Riverside, and San Diego compete in a tournament for soccer supremacy. The tournament is hosted on a rotating basis by each YMF chapter. This year, the tournament was hosted by San Bernardino/Riverside on Saturday April 4 in the city of Riverside. Teams representing Orange County, Los Angeles, San Bernardino/Riverside, and Cal Poly Pomona were in attendance for this battle royale. Each team consisted of seven players and with the requirement of at least one of the players being female. Orange County had a total of seven players proudly representing Orange County YMF. This event was the debut of OC YMF’s new black ASCE sports jerseys. These new jerseys definitely generated a lot of fanfare amongst all in attendance. The OC YMF team started strong by going undefeated during group stage. OC YMF beat the other three teams in the tournament and entered the final as the number one seed. The final was between Orange County and San Bernardino/Riverside. Despite valiant efforts, the OC team did not take the final win. The final score was San Bernardino/Riverside winning by four goals to two. With a whole year to prepare, OC has high hopes of taking home 1st place next year!